My mother in law has a persimmon tree, among other wonderful fruit trees in her back yard, and has been giving my husband and I pounds and pounds of persimmons. I eat them like apples when they’re ripe…but we have about 60 persimmons to do something with. I have recently re-ignited my relationship with my slow cooker, and found a simple way to make a spread from our abundance of ripe persimmons. And it makes the whole house smell delicious! 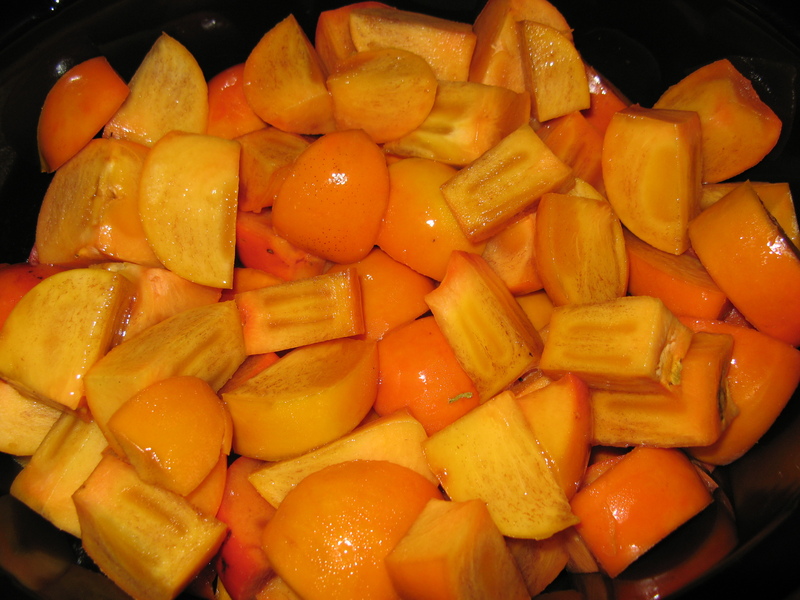 Place persimmons into a slow cooker; amount should fill a 6-quart cooker nearly to the top. Drizzle the lemon juice over the persimmons, cover the cooker, and cook on High for about 2 hours. Mash the persimmons in the cooker with a potato masher. 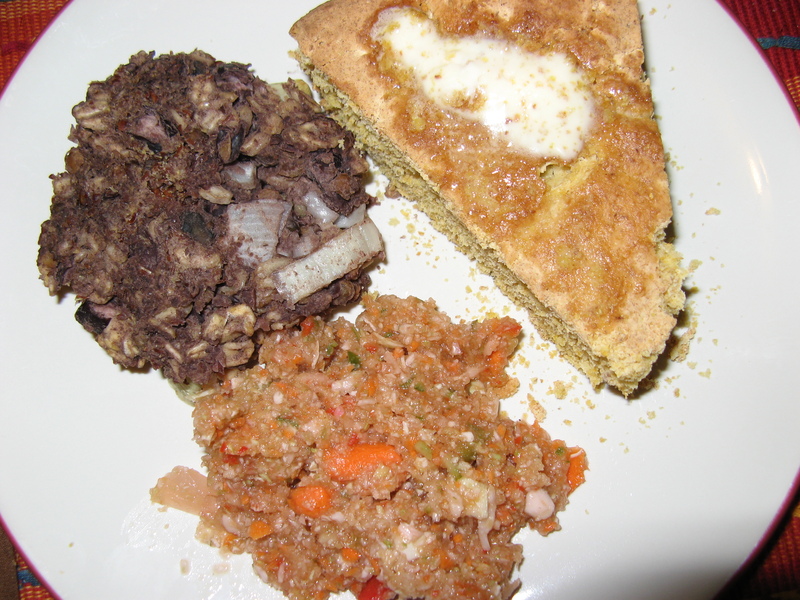 Stir in the cinnamon, cloves, and agave syrup, set the cooker to Low, and cook uncovered 6 hours or overnight. Stir several times if possible, to prevent burning during the long cooking period. After they have cooked down, transfer the persimmon mixture to a blender, filling the pitcher no more than halfway full. Hold down the lid of the blender with a folded kitchen towel, and carefully start the blender, using a few quick pulses to get the persimmon butter moving before leaving it on to puree. Puree in batches until smooth. If you have an immersion blender, you can puree the persimmon butter right in the cooker if desired. Sterilize the jars and lids in boiling water for at least 5 minutes. Pack the persimmon butter into the hot, sterilized jars, filling the jars to within 1/4 inch of the top. Run a knife or a thin spatula around the insides of the jars after they have been filled to remove any air bubbles. Wipe the rims of the jars with a moist paper towel to remove any food residue. Top with lids, and screw on rings. Allow the jars to cool to room temperature, then refrigerate the jars. I am hoping to have enough to use persimmon butter for Christmas presents this year. The first two times I tried to make it, the bread was very dry and I wasn’t super pleased with the result. This time I added chia gel, as one of the comments suggested, and decreased the amount of flour. Also, I tried the “no-knead” style to preserve the natural sponginess. I find this bread works best cooked on a “pizza stone” rather than in a bread pan. I still haven’t reached perfection with my sourdough bread, but fermented foods are both an art AND a science, and there are many more loaves to bake. Happy Daylight Saving! Categories: Baked Goods, breads, Recipes | Tags: baked goods, bread, Fall, gluten free, gratitude, persimmons, slow cooker, sourdough, sugar free, vegan, vegetarian | Permalink.